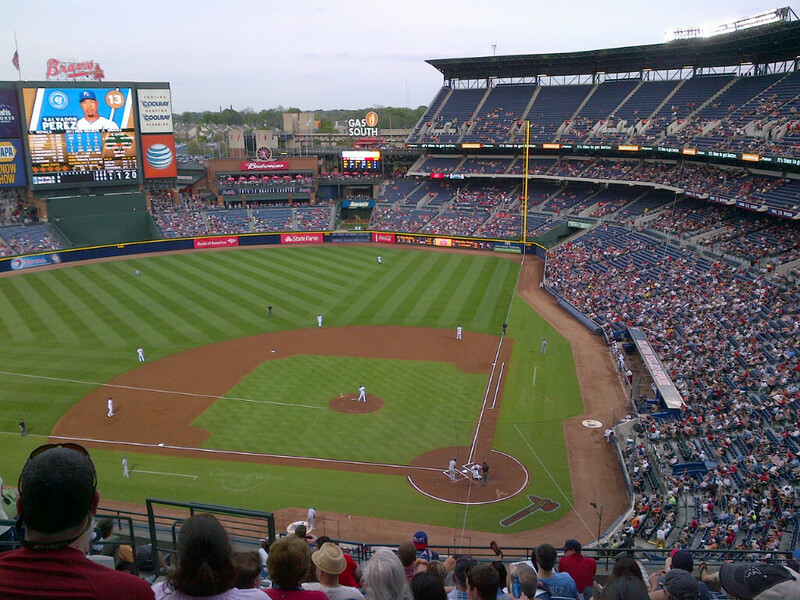 I attended my first Atlanta Braves game last night, with the then-AL-Central-leading Kansas City Royals in town for the first of two games in thirty-six hours. Getting to Turner Field via public transportation is easy, particularly considering Atlanta’s bad reputation for transit. The park itself is nice and clean, with three escalators ferrying us to the top level, where we were sitting. Originally constructed as part of the 1996 Olympic complex (it cannot in any way be overstated how much Atlanta loves the ’96 Games), it does not show its age, even if the third escalator broke down while we were on it, bringing to mind Mitch Hedberg’s bit. But let’s not dwell on the notion of being too lazy to take the stairs on one’s way to sitting and watching three hours of baseball. 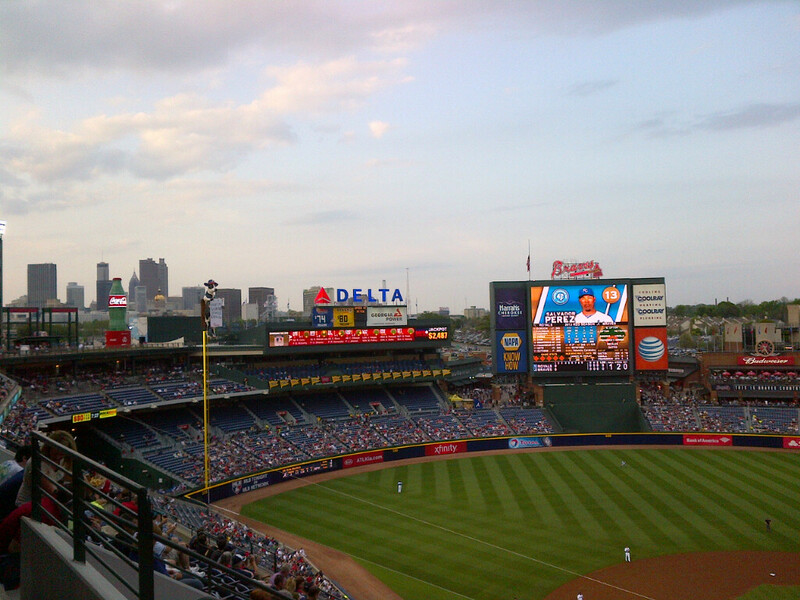 Instead, let’s note that Turner Field has roving Chick-fil-A vendors and a nice view of the downtown skyline. With a seating capacity of roughly 50,000, it actually is bigger than Comerica Park, but even sitting in the top section, I felt closer to the game than one might at some technically smaller parks, and there didn’t look to be a bad seat in the house. It was good that we were closer to the game, too, because the Royals and Braves, who were off on Monday, were celebrating a belated Jackie Robinson day by having everyone wear uniform number 42 in his honor. This made it difficult to keep track of the players, particularly hitters and pitchers, a difficulty the apparent lack of an active stadium announcer compounded. Swinging hard in the other direction, though, was the overly detailed digital scoreboard in straightaway center that had almost too much information on it to be readily intelligible. Mitigating all of this, thankfully, was an organ player who kept the whole scene loose and made me smile by playing his or her own version of “Call Me Al” everytime K.C.’s Alcides Escobar came up to bat. The game itself was all about the long ball. Atlanta’s Juan Francisco hit a solo shot in the second to open the scoring for the night, and Kansas City’s Chris Getz answered in the third to even the tally. The Royals manufactured a run in the top of the fourth, and their 2-1 lead lasted until the seventh, when Francisco got out on another solo HR to even the score. The Braves broke the tie the very next inning, when Jason Heyward and Justin Upton hit back-to-back solo home runs, Dan Uggla hit a solo HR two batters later, and the team manufactured a run when they pinch-ran Jordan Schafer for Francisco, and Schafer stole second and scored on a Chris Johnson single. K.C. got one run back in the ninth, but that was all they could muster, as the home team won its tenth straight, and pushed its MLB-best record to 12-1. Two final notes on audience participation: First, they played “Sweet Caroline” late in the game, perhaps as a tribute to Boston, although maybe they always play that song, and second, I could not bring myself to do the tomahawk chant/chop, although it is an impressive display to witness in person. 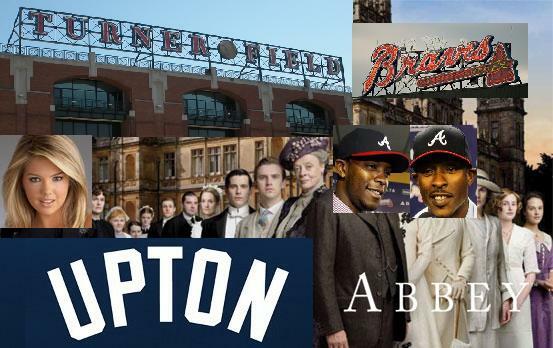 This entry was posted in ALDLAND and tagged alcides escobar, atlanta, atlanta journal-constitution, braves, chris getz, chris johnson, dan uggla, fried chicken, jackie robinson, jason heyward, jordan schafer, juan francisco, justin upton, kansas city, luis avilan, mlb, royals, turner field by AD. Bookmark the permalink.